Classmates and running teammates Reagan Flannery (‘20), Lauren Perlish (‘19), and Aliza Thir (‘21) chatt at a running event. Do you love the Downingtown running community and want to improve your running skills ? Want to interact with other runners from other schools, making new friends ? Then keep an eye out for upcoming running clinics like the one recently hosted by West track coaches on on March 23rd, at Downingtown Middle School, for high school, middle school students and parents. This Clinic was developed to help distance runners improve their performance, stretching and overall health in running. 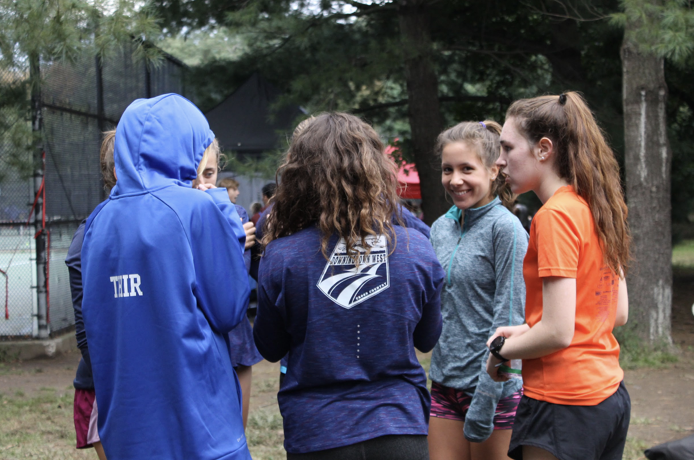 While learning how to run in different activities and understanding how to properly take care of injuries, athletes met new friends in the distance community. Downingtown West Distance Coaches Schmidt, Burns, and McCarron set up a fun filled morning activities from 8am to 10am. The coaches took the time to see what each athlete wanted to learn about different topics. As Coach Burns always says, “Something good is just about to happen,” and I along with anyone at the clinic agreed; it was a wonderful day full of tips provided to all runners in the area. There were amazing speakers who spoke about topics from competing to maintaining health for distance running. Amazing athletes such as performance coach and athlete Brock Butler shared his race day strategies. Along with Butler, Dr. Brianne Scott and Dr. Arianne Missimer presented key things to know about running form and injury prevention. The last speaker was Joe Fuhr, who spoke about his experience running with his wife and his use of Advocare products to maintain his health and stamina. Clearly, this clinic helped runners in many ways. It was a success, and the community looks forward to more!